Secondary double glazing is ideal for sound insulation and heat retention. It is typically less expensive than replacement windows, but is still incredibly effective. An additional benefit is it’s ability to reduce draughts and thus reduce energy bills. Aluminum secondary glazing, is an exceptional materials to use in almost any home and is a quality product that is made to last. All of our secondary glazing solutions are custom made to measure to meet the specifications of your property. This means that any building can benefit from secondary glazing regardless of age or style or location. If you are unsure, you can always contact us and we will be happy to discuss you home requirements. 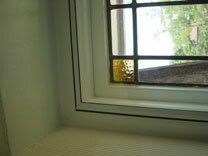 Aluminum secondary glazing, and can source almost any colour that you require so it fits perfectly within your home. Please contact us to discuss your secondary double glazing requirements in more detail, we are happy to discuss your requirements and advise you of the best option or product to use on your windows. We offer obligation free quotations so you wont feel pressured to buy and we will not harass you with ongoing phone calls or emails. If a window is in good condition and you just need to reduce noise or improve you home insulation then secondary double glazing is almost certainly right for your home. Listed properties and homes in conservation areas can also benefit from secondary glazing where traditional double glazing is not permitted. Aluminium secondary glazing allows the use of an incredibly strong and secure material, in a variety of colours and designs we will ensure it is in keeping with the style of your home.